Mini Dresden Pincushiony Gifty Goodness! I have the BEST ever next door neighbour. She’s the generation before me, but possibly even better for that. She’s fun, cheerful, quirky, loves children, independent and adventurous, in love with her husband and family, esp the grandchildren, and her home and garden are open, welcoming mazes of treasures. Her garden has stone owls, hidden copper dragonflies, sparkly things twirling from trees, squirrels and chickens (real ones) – she even has a window in her hedge, for goodness sake. AND SHE SEWS. OMG. I love her. What do you give a lady like that for her birthday? This is a pincushion – it’s filled with lavender because I tried polyfil toy stuffing and I didn’t like the puffiness nor the lightweightness for a pincushion. i heard you could fill them with crushed walnut shells or somesuch, which adds weight and sharpens yours pins (is this true?) – but since I didn’t have any I filled it with dried lavender. It is kind of potent, but I think she’ll like it. 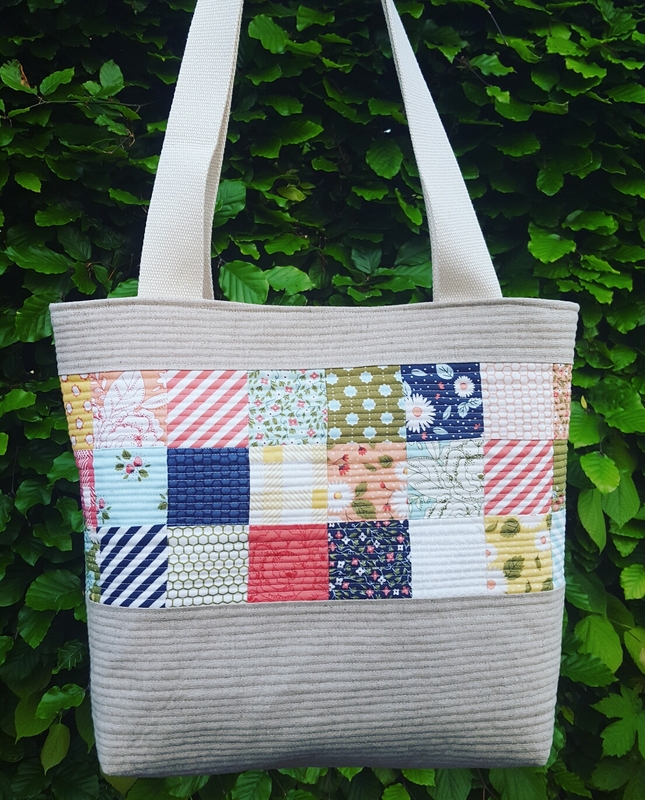 which is free if you sign up to the newsletter (no biggie, the fabric shop is gorgeous) or $1, and includes instructions on how to make it. 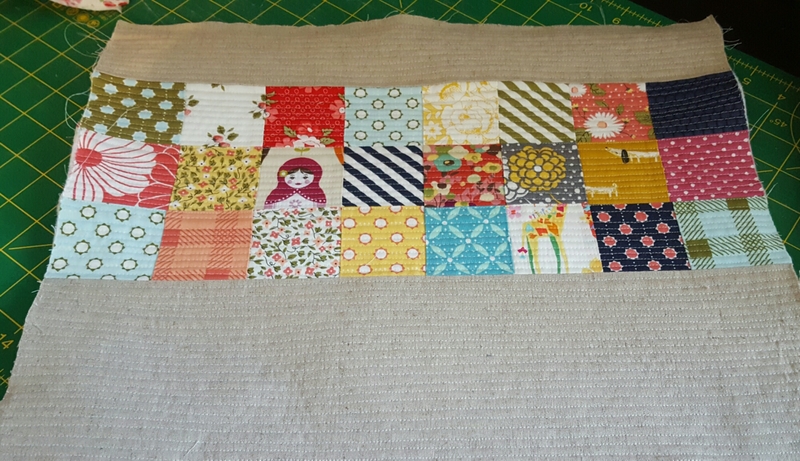 It’s so easy to make a dresden block – I admit though that the tiny-ness what a bit fiddly, but it didn’t take more than an hour or so and that was the first attempt. 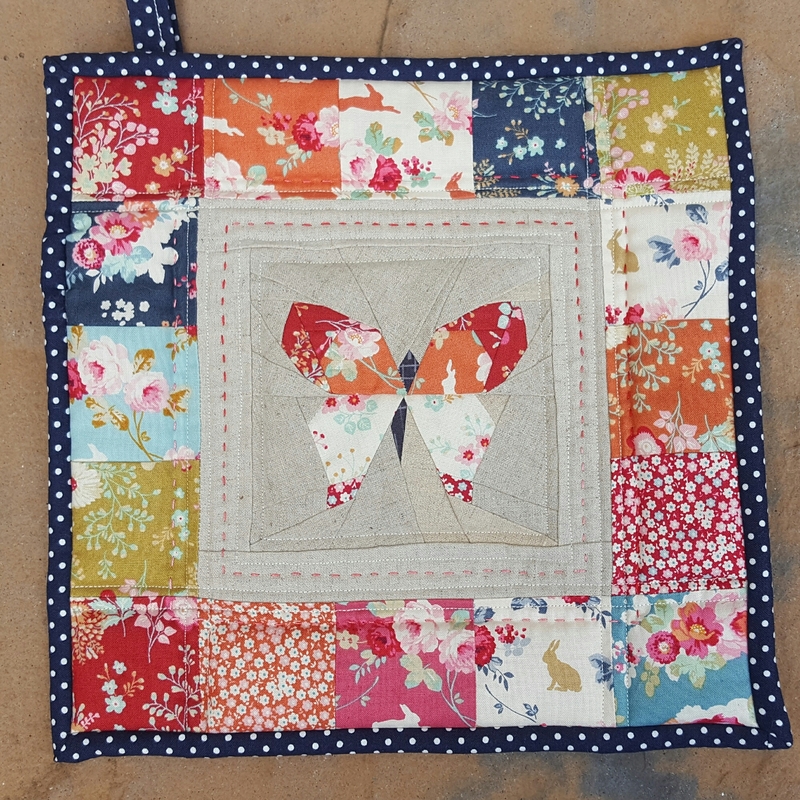 I whipstitched mine by hand onto a charm square of “modern backgrounds paper” fabric by Zen Chic for Moda, and made a centre circle in the same fabric. 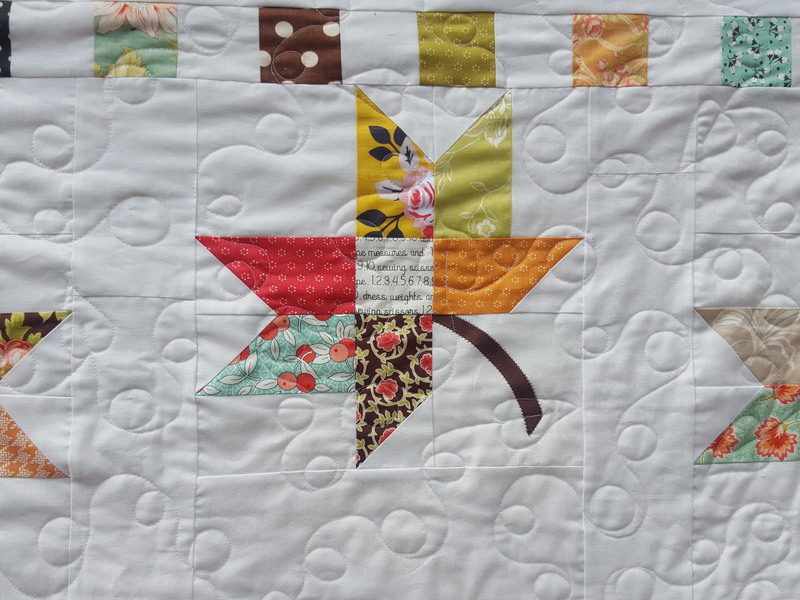 My centre circle is not perfect, I should have slowed down a bit to stitch such a small circle, but sometimes you can feel your quilting-time-hourglass sand running out! I did some hand “quilting” to flatten down the circle a bit, you can probably see it. 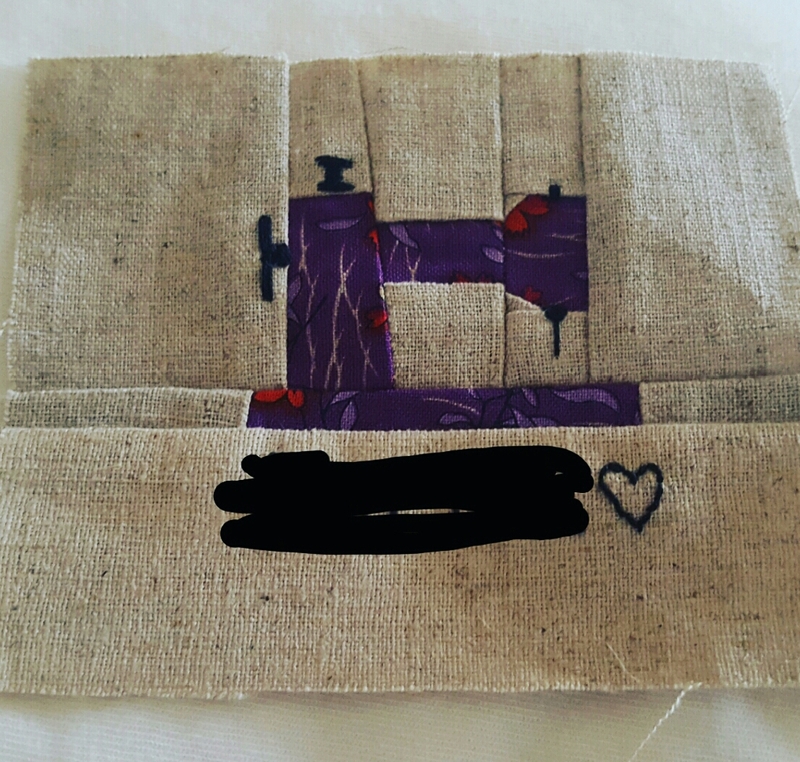 I backed it with a square of cotton batting for some stability, before sewing it RST to a red floral charm square leaving a hole to turn it right sides out, filling with dried lavender flowers and whipstitching the hole closed. Easy peasy. Aw cute. Thank you Westwoodacres for the pattern! 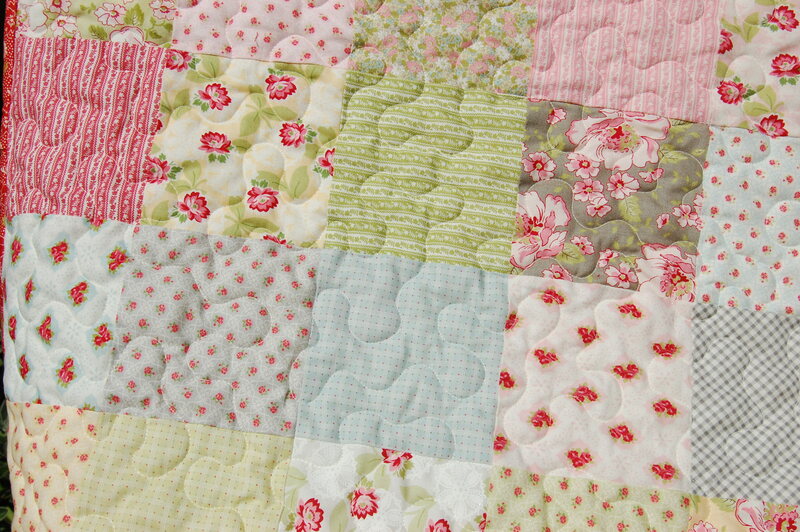 Soft, vintagey, floral, prettiness with both a modern freshness of colour and an authenticity you don’t often find in modern fabric lines which are so often “trying” to have a vintage feel but don’t quite make the grade. I admit the colours are not showing up well in our first-week-of-spring-cold-but -bright Scottish sunlight; you might have to trust me about the gentle romance of these fabrics. I used fat eighths of the Apple Bloom and Spring Lakes collections, but then took out the teal colours from Spring Lake and added Taupey-greys and Cadet blues from other Tilda collections. 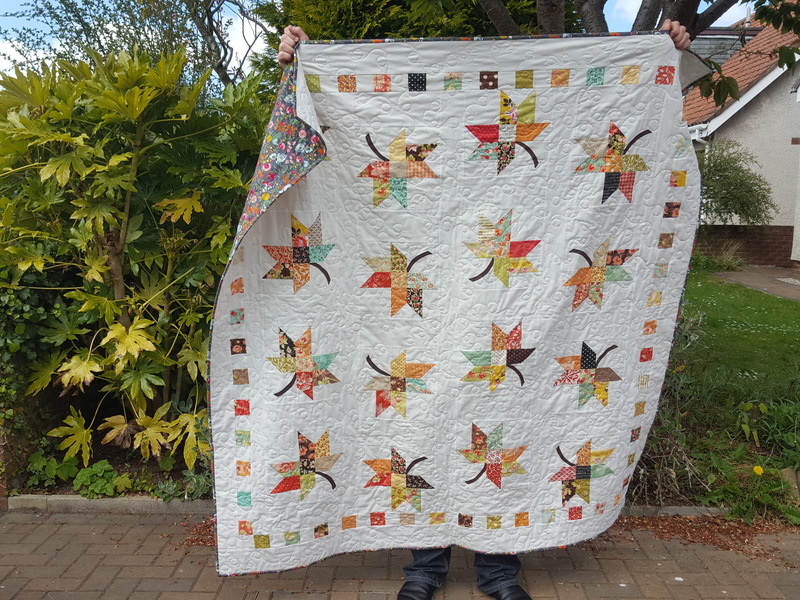 It is a commission quilt; my friend commissioned it as a wedding gift for a lovely girl whom I did actually meet once and I thought was fabulous. I had a telephone consultation with her, and they live in a whitewashed Scottish cottage with pale, duck-egg blues and ivory/ white colours. I just knew Tilda would be the right fit. Not the rice obviously. 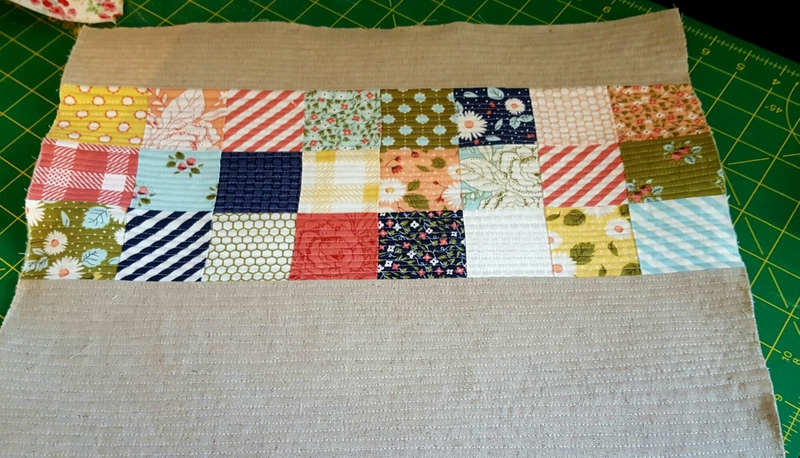 The big squares were cut to 8.5″ and the smaller ones making up the 4-patches were 4.5″, and I just alternated them. 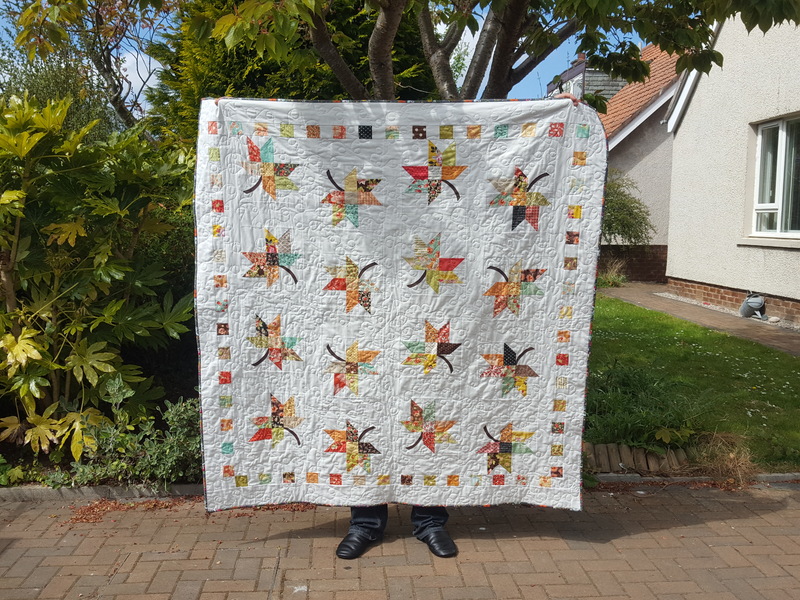 You would need 13 fat quarters or 26 fat eighths or equivalent to make this quilt which finishes at 61″ square with a 3″(ish) border. It’s a great throw size – big enough for 2 on a sofa or someone to nap under. 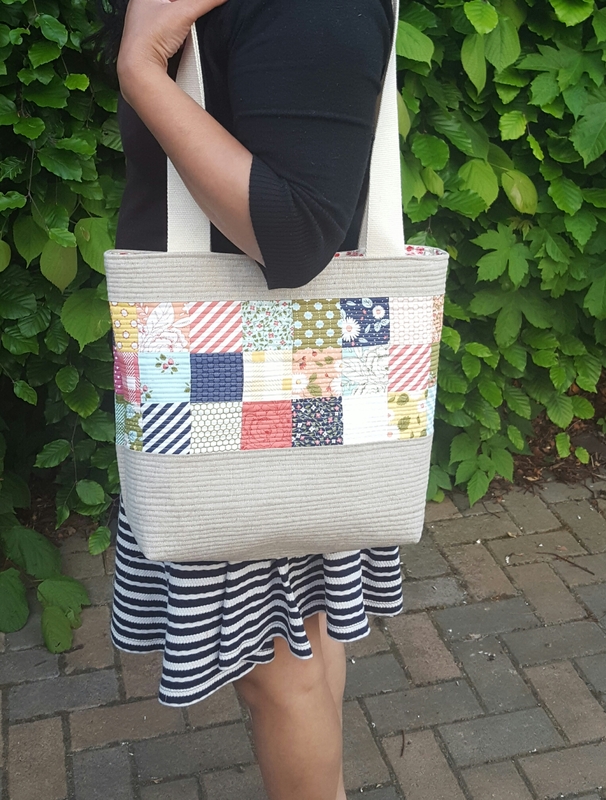 This is the back – Pernille in Cadet blue, pieced with some charms from the Tilda collection “Happiness is Homemade”. I really love the back! Almost more than the front, always disappointing when it takes a fifth of the time… The couple’s bedroom is duck-egg blue, so I am hoping that this will make up for the pinks and greens on the front of the quilt; a certain degree of reversibility. 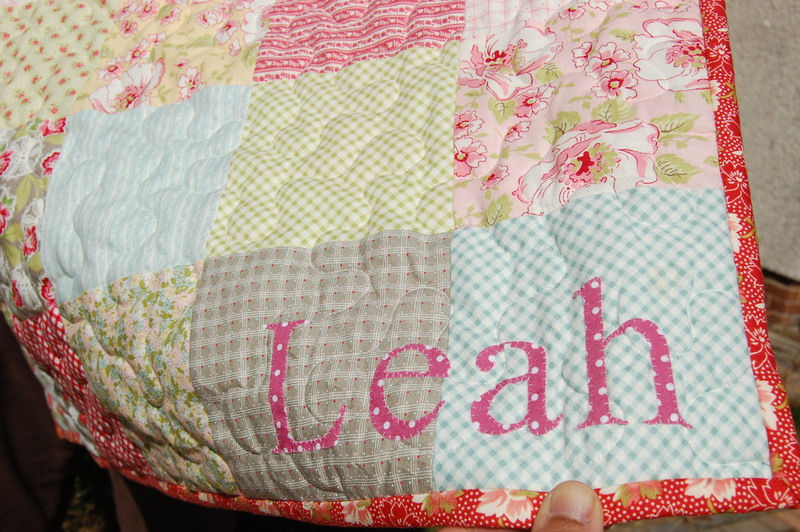 I hoped that the other colours would make this quilt fit into their home even if they re-decorated. They’re going to need to keep loving shabby-chic pastels though! 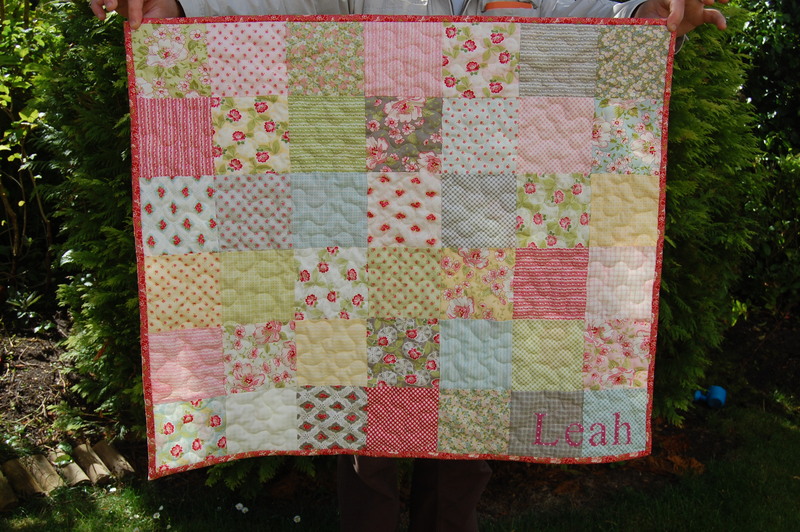 I quilted it in a loop + swirl pattern, and if you look very carefully you can maybe see a “L + M” quilted in the middle (the couple’s initials). 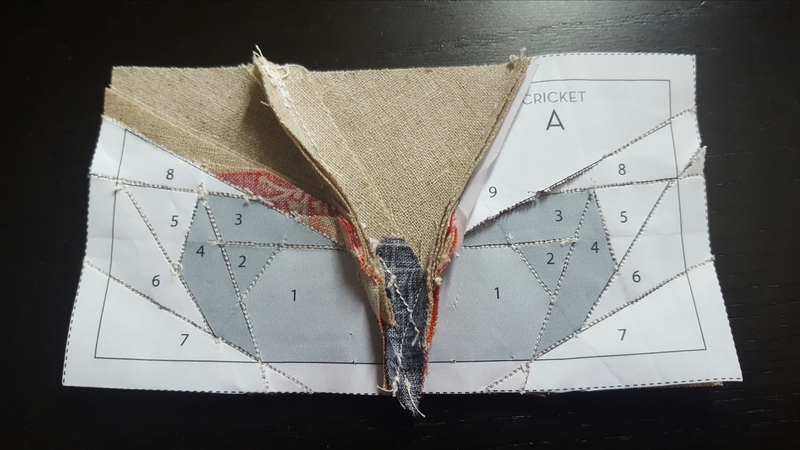 It’s not showing up very well here, but that is kind of the point… Batting is Quilter’s Dream Orient, a natural batting made of cotton, silk, bamboo and Tencel (eucalyptus), which gives it a wonderful drape and softness, without a lot of weight. 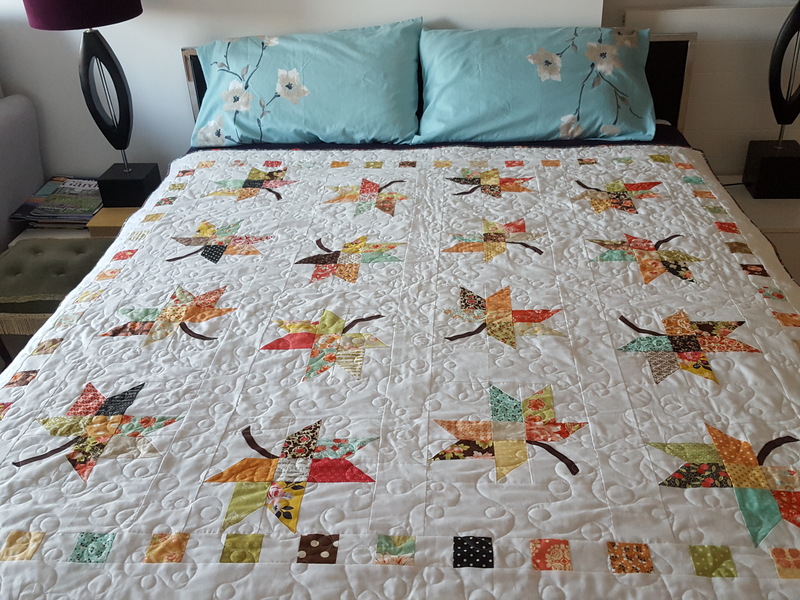 It is definitely my favourite batting for special quilts, although it is expensive. 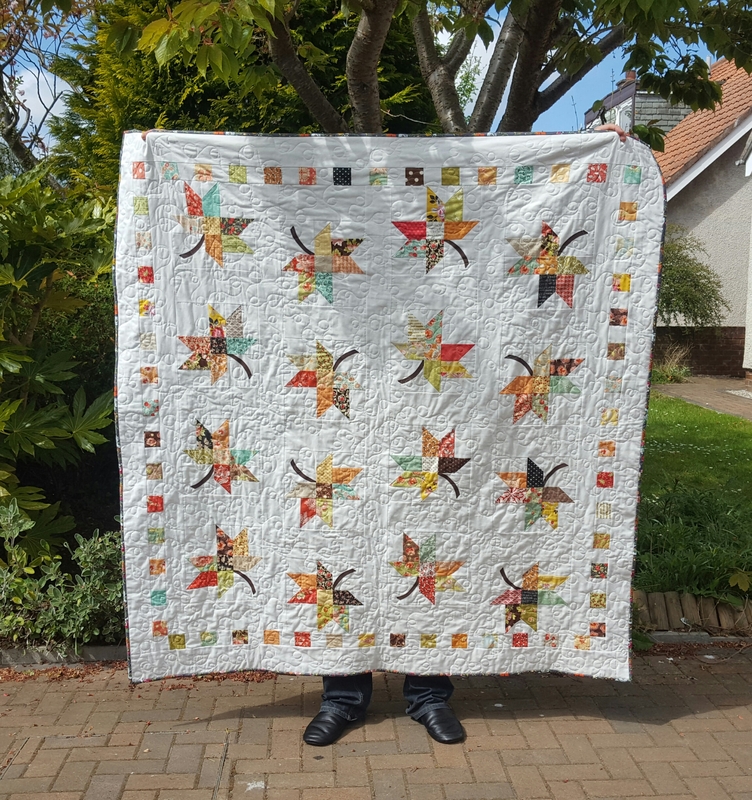 That bright, bright sunlight to which we have become unaccustomed over the winter certainly shows off the texture that free-motion quilting gives a quilt. I love that all those curves soften the geometry of squares, but so subtly. I feel pretty sure she’ll like it, if only because I had the opportunity to talk to her about her tastes. What I am less sure about is how I will feel about letting it go! Do I always say that? 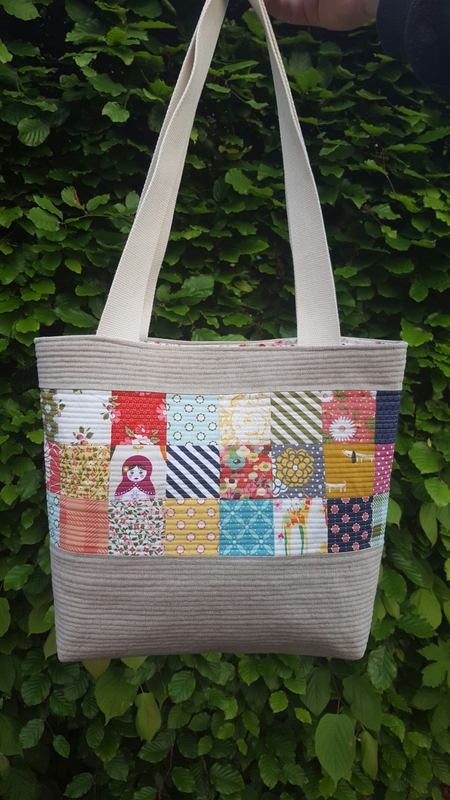 This time I decided to buy a few Tilda charm packs for a summer quilt for us, just to make the hand-over easier! After all, with fabrics this beautiful and timeless, it’s worth allowing the name to share brain space with some slightly trippy childhood culturally-significant memories, huh? Happy 2016 lovely creative folks! Thanks for stopping by – despite it being 4 months since my last confession. And since switching to WordPress I get stats, which shows you guys keep checking in, so double thank you for putting up with my prolonged absence! SO much to tell you about; I had an amazingly successful craft fair and have some thoughts on that; some Christmas stockings for which a tutorial has been requested several times; I have some quilts in the making; I did some free motion embroidery; my EPP hexagon quilt top is 3/4 done; I wanted to show you how I made a wee felt mouse doll in a tin for a friend… it’s hard to know where to start! So I decided to use charm packs. I have a terrifying weakness for charm packs and precuts. 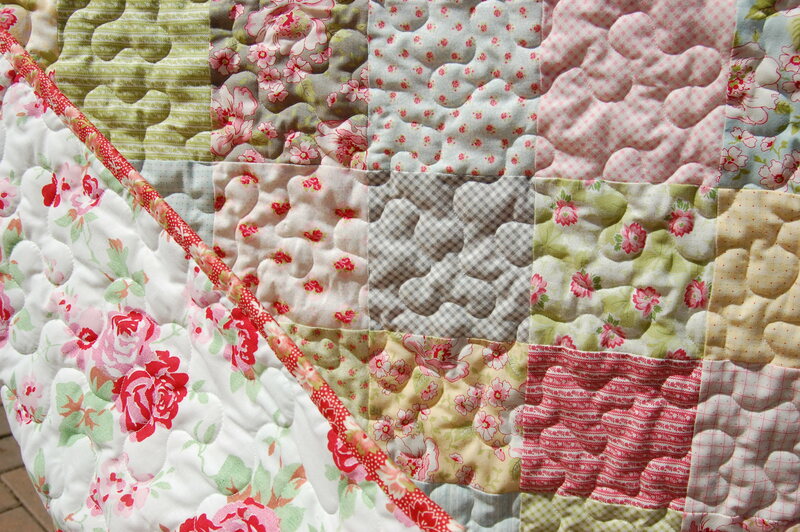 To have a tiny bit of a whole collection of beautiful coordinating fabrics in my hand makes my heart flutter a little. But it does mean that there are more errant charm packs hanging about having a fabric party in my cupboards than there will ever be quilts. That’s scrap, right? that I truly fell head over heels. 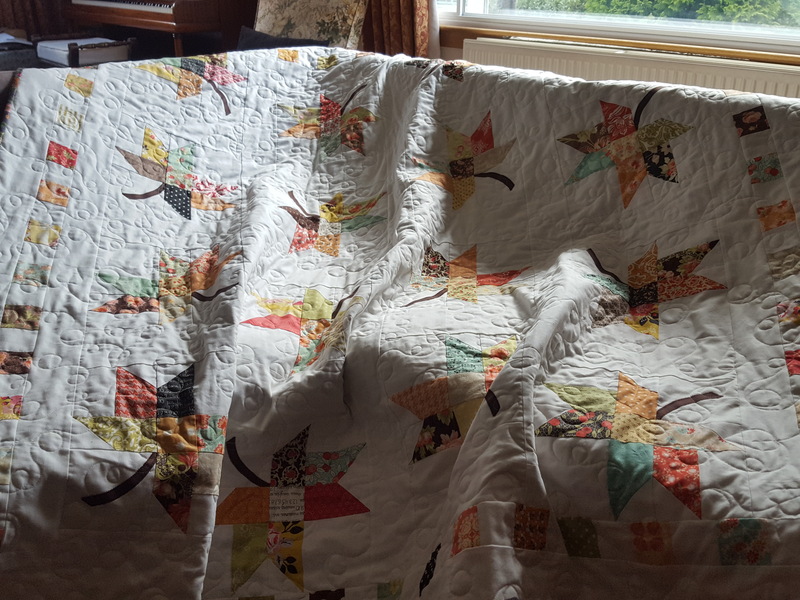 I think it’s because a lot of the scrap quilts you see have a tendency to go quite dark, and I really wanted a crazybright quilt; hers kind of all coordinates and still manages to look happy-scrappy. So I started with a base of the same collection as she did, my favourite collection, Happy go lucky, by Bonnie and Camille for Moda, and then added a few other packs which used similar colours; adding a bit of pink, but no brown, black, dark green or purple. 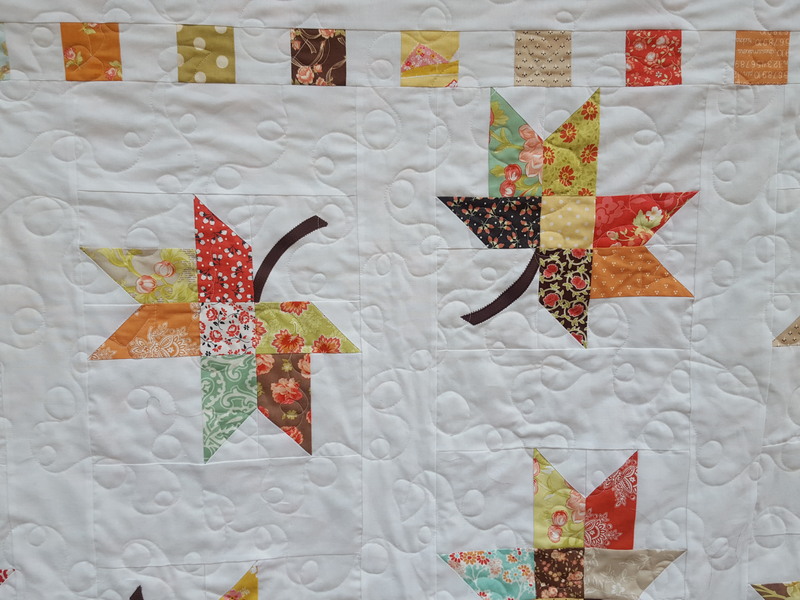 I highly recommend visiting that blog page btw, she shows off a variety of utterly gorgeous quilt confection perfection, as well as listing the charm packs she used for her quilt. 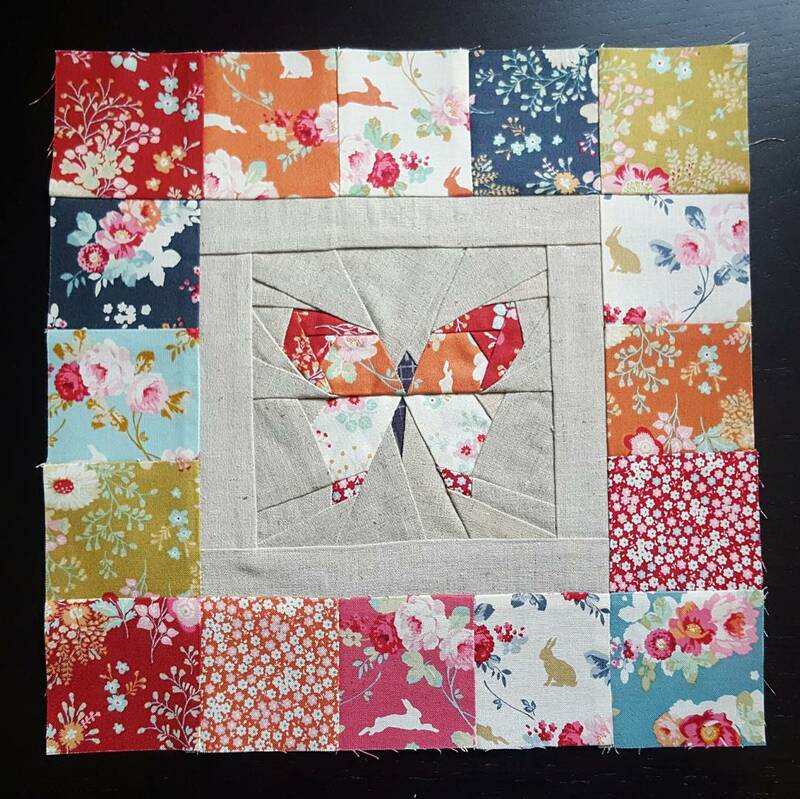 Once I partly pieced this 16 x 16 square piece (about 32″ square) I reflected on how it looked a little “flat”. Maybe the colours were too coordinated? It used some “happy go lucky”, “beach house”, “one for you, one for me” (it’s just OK) and “garden project” (which is really really nice) – all for Moda. So I chopped up and threw in some “Sunkissed” and “Ambleside” which I had left over from other projects. Once it also had my own scraps in, it seemed to have a bit more depth from the varying shades of each colour, which I think helps, although it will be paler overall. But… I think the thing I will enjoy the most is looking at the pieces of scrap fabric I used from my stash. Already, my eye sees them immediately + recognises them as fabrics I bought with love and have used. I like the effect of the charm pack squares but I don’t have that same feelingyou know, I think I might have to raid my stash after all to make it feel more unique and like it’s mine. By the way I am doing most of this as a “Leaders and Enders” project. This is a technique devised by Bonnie K. Hunter I think (http://quiltville.blogspot.co.uk/). You know how when you finish a line of sewing, you cut your thread, leaving long ends of thread which essentially get wasted? Or when you start sewing, esp piecing triangles or delicate fabrics, your machine tries to eat the fabric? 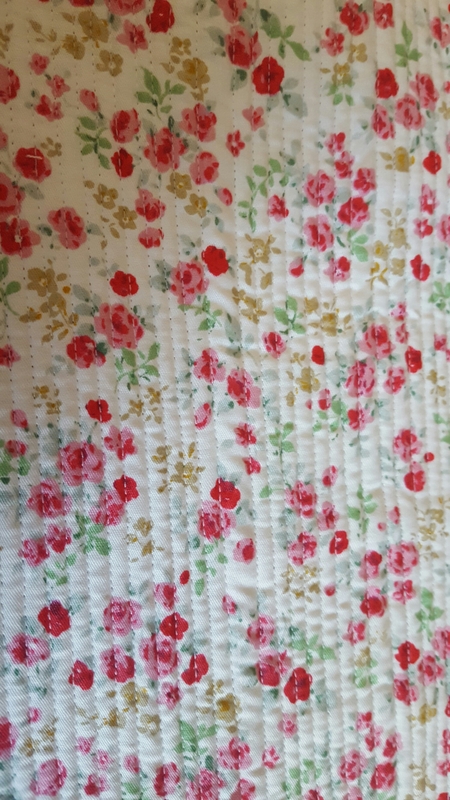 My mother-in-law always uses a piece of scrap fabric to start and finish her sewing (the needle stays in this fabric piece when you finish sewing/ switch off the machine). 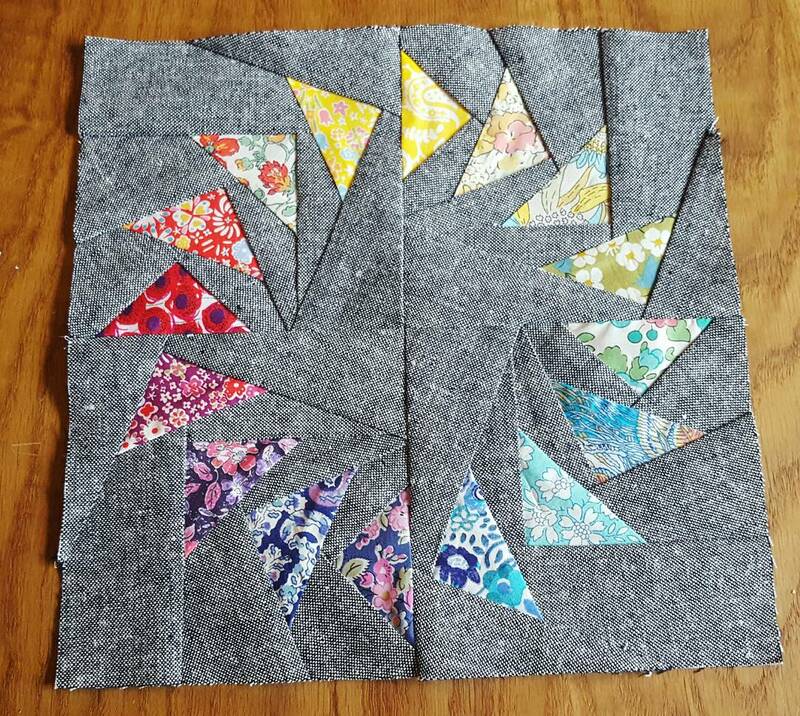 Well, a leader/ender is a small bit of patchwork you want to sew together; you use that instead of scrap fabric so it doesn’t eat the corner of the HST you’re making for your proper project, chain piece everything you want to, and then finish with another small piece of your “leader/ender” quilt. That’s my “Ender”, which I left in the machine for whichever quilt I decide to work on next time, when it will act as my “leader”. 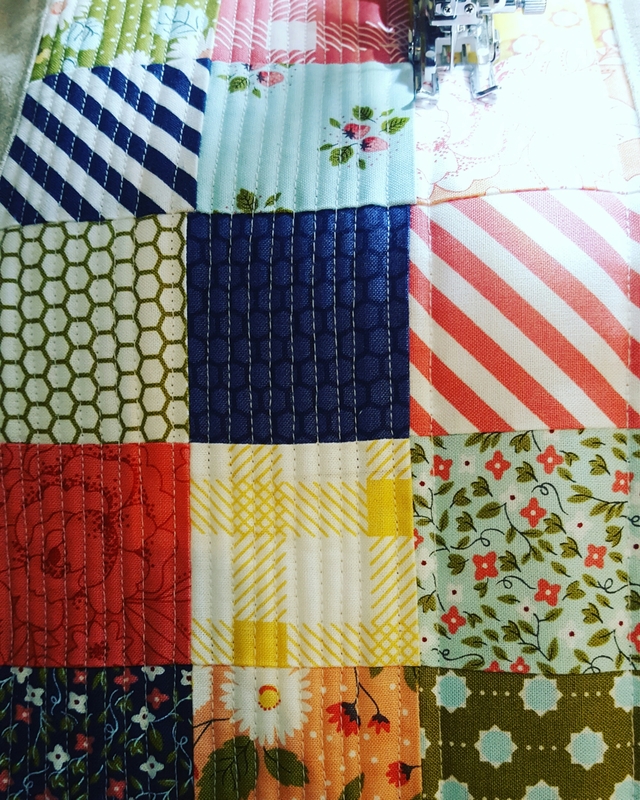 Before you know it, within a few quilts you have sewn together lots of small 2.5″ squares, first into pairs, and then into 4-patches. Without you really noticing you’ve done it. Well, it slows you down a little I admit. 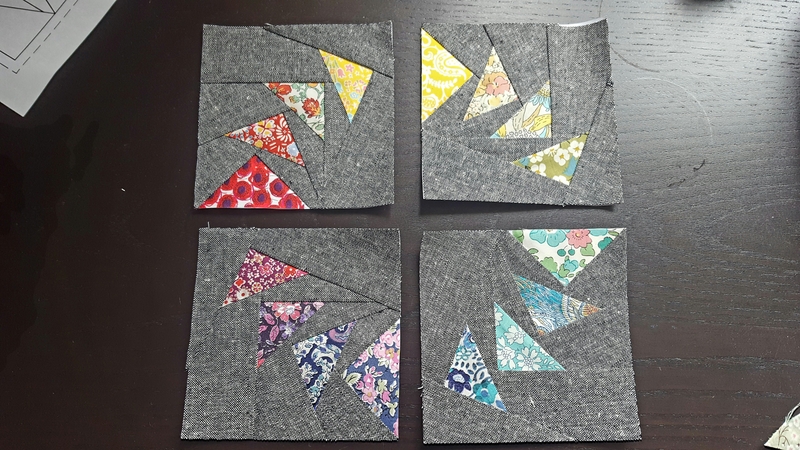 But I certainly didn’t notice sewing 1,100 little squares into 4-patches, as much as I would have done had I tried to just piece them all at once (I might have sworn off quilting forever!). Once you put the 4 patches together, the 16-patches seem to go together pretty quickly, and because it’s scrappy, it’s all pretty mindless. 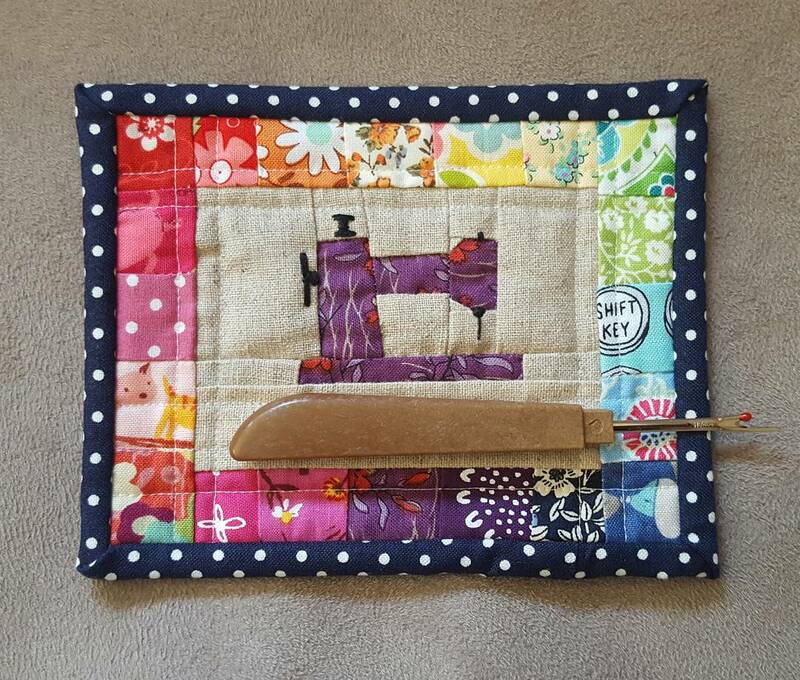 Instead of trying to keep your rows in order, you just sew randomly. Bliss.